LED48T8-288-001W fits into standard, G13 bases and is designed to replace T8 fluorescent tubes. 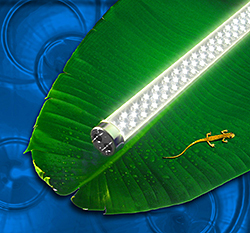 The lamps offer an operating life of 50,000 hours, or 5.7 years of continuous light. The ultraviolet-resistant, polycarbonate housing over the LED tube provides increased protection — no glass to break — and shields against environmental effects. The lights generate up to 1,342 lumens at a color temperature of 5,000 Kelvin (K) and 1,072 lumens at 3000K, compared to the average 810 lumens for equivalent conventional fluorescent tubes.